For four days, I had been calling Magmatrek each morning to inquire if they would run an excursion to the top of Stromboli the next day. For three days, I was told to try again the next day. It was March, the weather in Sicily was too rough, too unsteady. Each time, Beatrice asked me if my father was really fit enough, how old he was, and she reiterated that the ascent of Stromboli was a strenuous climb and that the company retained the right to refuse people who appeared unfit. When she finally saw my father and me walking through the door of the small office, which was crammed with hiking and mountaineering equipment, after the rough sea had eased down a bit and the ferry to Stromboli had resumed operation, Beatrice had to laugh: “Ok, now I see that I shouldn’t have worried!” My father is almost 70 years old, but the mountain experience radiates from his tanned face. The wild beard, the hiking boots and the fleece jacket also helped to alleviate any concerns. Judging by the composition of the travelers who are applying for participation in today’s ascent of the active volcano, Germans and French are the outdoor nations of Europe. Just before we will set off, a Japanese couple will show up, whose one half is pregnant and whose both halves are really inadequately equipped. Hiking boots, sticks and lamps are available for rent, but people who don’t even have a sweater better remain at the beach. The excursion will kick off at 15:30, so we still have a few hours to stroll around Stromboli town, which is more like a village. Only the small harbor showed the level of activity which is typical for harbors of islands which can only be reached by boat, with relatives waiting for their children, cooks waiting for foodstuff, and pensioners waiting for newspapers. After receiving their respective packages, the islanders speed off on their vespas, three-wheelers and golf carts. The narrow and steep alleys prevent access with larger vehicles. 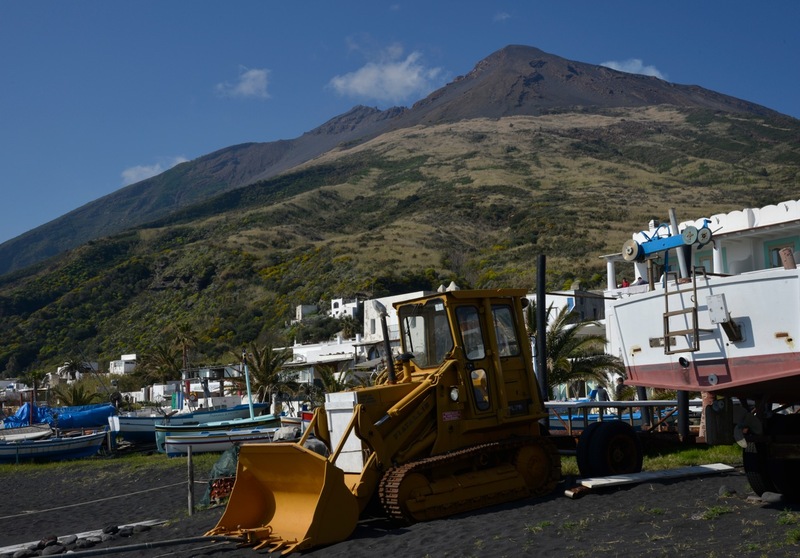 Around 600 people live on Stromboli despite the volcano’s activities. 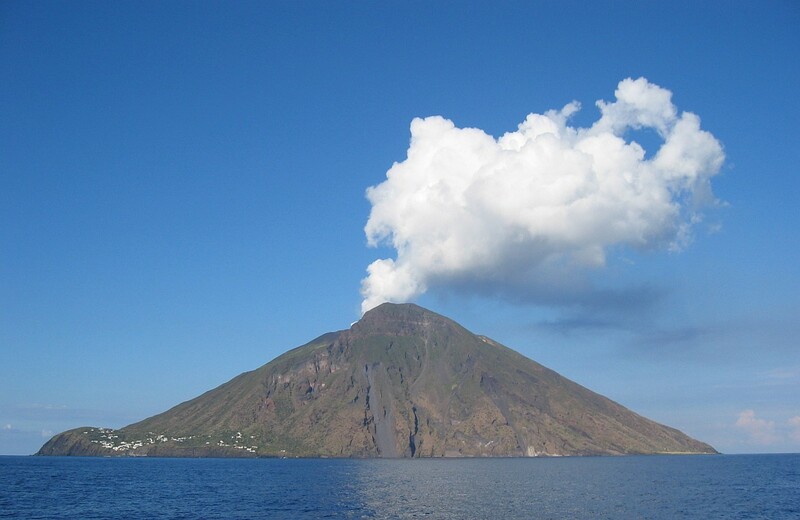 There are many islands with volcanoes, but Stromboli is the volcano. The 924 meters (3,031 feet) above the water are only the tip of the volcano which rises from the sea level almost 3 kilometers (8,860 feet) lower. Hence the characteristic conical form of the island. The volcano shapes life and the economy on Stromboli. Buildings are only erected close to the water, from where one could quickly escape by boat if it should become necessary. The steep slopes are unspoilt. Money is made from visitors. Many of the beautiful white houses with their doors and window frames painted in blue are bed & breakfasts, restaurants, hotels. Colorful signs offer mountain treks, island circumnavigations by boat and fresh fish. The street names are indicated on artistic tiles like in an artisan colony. It is very quiet, almost sleepy, at least now in March. The beach is black. The lower two thirds of the volcano are covered with bushes, small trees and grass. In the upper third, there are only black ash and black stones. There is no more life up there. Smoke rises from the crater, white like clouds in front of the blue sky. So, this is the volcano through which the protagonists in Jules Verne’s Journey to the Center of the Earth were catapulted back to the earth’s surface. Twelve people congregate at 15:30, each of us paying 35 Euros. Two young South Koreans have joined the Germans and French who are still in the majority. Everyone is equipped with a helmet and protective glasses. It is permitted to climb Stromboli without a guide up to an altitude of 400 meters (1,300 feet), but if you have made it here, you obviously want to go all the way to the top. Today’s expedition is led by Zazà, a guide who is not the youngest anymore, but who is visibly fit. With his swift steps, he leads the way, while his younger colleague poses as the rear guard. The pace is quick, as if the volcanic show would close at a certain time. Two or three times we pause to take breath. Everyone drinks water, only the two Koreans drink milk. After a few minutes, we continue. Some of the hikers are getting noticeably slower. It is getting colder and the wind is getting stronger. On the summit there is a proper windstorm, dangerously blowing towards the side of the ridge on which there are five active craters. Stromboli is a continuously active volcano. We should now see the fire which our planet thrusts up at a few selected spots in order to entertain us humans. But it is too hazy. Are these clouds? Is it fog? Or smoke? The lungs work like a sensor, already aching after a few seconds. I have to cough and I feel a piercing pain as if I had bronchitis. My nose is runny. Now filter masks are being handed out. One of the South Koreans has his own with him, satisfying the stereotype of the Europe-traveling Asian. Twelve people are anxiously looking into the haze, through which one cannot discern anything. Twelve pairs of eyes are staring into the abyss like in a cinema where the film begins late. Twelve faces are coughing and sneezing because of the cold, the wind and the sulfur. Those, and they are the majority within the group, who have carried their cameras up the mountain, are disappointed about the lack of dramatic filmable and photographable material, although every 20 minutes an explosion roars like thunder. One of the hikers lights a cigarette. Next to all the photographers I look a bit antiquated with my writing pad. But now my utensils from the last century are better suited to describe the situation than all the gadgegtry which was uselessly carried up 900 meters (2,900 feet). More fog moves up from the sea and mixes with the quickly lowering darkness. The moon shines behind us, it is two days before full moon. Will this provide enough light for the nightly descent? I already can’t see the other members of the group unless I stand directly next to them. Soon I won’t see my notepad and will have to cease writing. The crater is at an altitude of 700 meters (2,300 feet), the fountains of lava are flung into the air up to 350 meters (1,150 feet), Zazà explains and apologizes repeatedly for the fact that there is not much to see today. I personally don’t mind at all, I find the sound effects and the gases impressive enough. The guides recommend that we leave. The volcano gives us a shout with another explosion. This time the rumble is considerably louder and particularly longer. Like thunder and an explosion and a derailing train all in one. We use another route for our descent and glide through the fine black ash with quick and long steps. Like running down a sand dune, just in large and in black. I ask Zazà how often he climbs Stromboli. About 200 to 230 days per year. “But how many days of the year do you work?” he counters with the routine of someone who has answered this question many times and who couldn’t have guessed that he has met someone who has made it his mission in life to work as little as possible. But he admits that he is lucky to have this job. Back in Cycladic Stromboli the moon lights up the white paint of the houses. A cat remains sitting while we file past. A three-wheeler, known locally as lapa, squeezes past us in the narrow alley and spreads the smell of diesel. Everyone is hungry and thirsty. The participants walk off into different directions, looking for a tavern, a restaurant or a bar. Bit by bit, they all show up at the same tavern, the only one which is open. During the ascent, we didn’t have enough breath to get to know each other. During the descent we had to watch every one of our steps. Now, with beer and a simple and overpriced pasta dish in front of us, we finally introduce us to each other. Because we didn’t see the spectacular lava fountains due to the haze, the organizers offer us to try again tomorrow. But everyone has other plans already. We are all going to be on the ferry tomorrow, going to Lipari or Milazzo. Stromboli is a one-attraction island and hardly anyone stays more than one night. Only Ingrid Bergman and Roberto Rossellini stayed a bit longer while shooting the film Stromboli in 1949. So little was there to do on the island that Mrs Bergman became pregnant during her stay. This entry was posted in Italy, Sicily, Travel and tagged Stromboli, volcano. Bookmark the permalink. Yes … ditto … great read. Thank you, that’s very motivating to hear! I really enjoyed reading this adventure! Thank you very much! Many more stories from Sicily to come. are a great author. I will remember to bookmark your blog and may come back from now on. I want to encourage yourself to continue your great work, have a nice afternoon! Nice post. My husband and I are considering hiking Stromboli this July with Magmatrek. Could I ask where you stayed on the island overnight? Everywhere I’ve looked so far seems overpriced for a one night stay… Maybe you have a good suggestion? It is quite expensive, that’s true, and July is in the middle of the season. I don’t remember the name of the place I stayed, but it was in March or April, so we could simply show up and find something for the night. Because July is warm, you can of course simply stay outside after the hike and sleep on the beach. I don’t have a bucket list but if I did, I’d add this to mine. I am glad to hear you don’t have a bucket list! I always find it sad when people have a list of things to do, places to see, etc, wondering what they’ll do once everything has been crossed off. Also, it makes traveling seem like a job with a to-do list. Sadly, their reports then often sound accordingly (“This year, I did the Maldives and the Inca Trail.”).